Imagination was showing off some goodies at MWC including Rogue/Series6 bearing silicon and final Caustic ray tracing boards. The demos weren’t jaw-dropping in nature, but functional silicon is always a good sign. 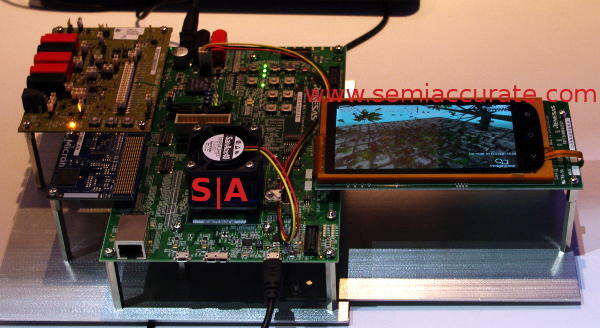 The first demo was a development and debug board for the Renesas APE6 SoC. This chip has “8” ARM cores in the dumb.Dumber layout, big.little in official ARM parlance. That means four A7 cores and four A15 cores, plus a PowerVR Series6 GPU. The demo below was showing off OpenGL 3.0ES and OpenCL 1.2 capable hardware doing GPU compute tasks. Word on the street prior to Rogue silicon being available was that Imagination was the only company to get OpenCL right with this generation of hardware. Early FPGA demos were hobbled, and that lead to rumors of borderline terminal architectural missteps on Rogue. Luckily the functional silicon had none of the bottlenecks shown by the FPGA boards, and all is as we told you last year, they are the only ones who got this generation of GPUs right. There were a few other demos, all eerily similar to the transform ones from a year ago. The idea is simple enough, if you do certain tasks like image transforms or physics/modeling work on the GPU, they go much faster. They are very parallelizable and also very simple tasks per iteration but with borderline silly numbers of iterations, perfect for GPUs. The demos show this off well, but they also show that by doing it on the GPU you save power too. Imagination had the same demos from last year with newer silicon and the same type of results. Now if only Google would stop being so pig headed and stupid about OpenCL things could move forward to the benefit of everyone. Next up was Caustic, you might recall our writeup from last GDC about their ray tracing hardware. Back then it was shown off using their software, but it showed enough promise for realtime ray tracing to be intriguing. The long rumored Caustic hardware was shown off at MWC in final form, you can buy the boards now. There are two variants, single GPU and dual GPU boards, with the latter shown here. The boards are called the R2100 and R2500, they come with 4GB and 16GB of DDR2 respectively. This says that the R2500 is just two R2100 on a single PCB with double the memory per chip, but they don’t share all of that memory space. Both boards use PCIe2, 8x for the single and 16x for the dual board. You can see the PLX PCIe switch in the center too, its presence pretty much confirms the independence of the two GPUs. This configuration may seem really odd to you, who makes a board with DDR2 in it this decade? Isn’t that just, “Sooooo 2004”? There is a good reason for this choice, ray tracing needs very random memory access, and isn’t all that latency sensitive. You can pipeline a lot of the work to hide latency, so a lot of independent memory channels at low speeds will buy you a lot more than a single fast channel. That is why Caustic used DDR2, it is cheap, low power, and low density for multiple channels. As you can see, the R2500 has 16 DRAMs per chip, the back side also has memory on board too. If there are 32 DRAMs per socket, that would potentially allow for 4x the outstanding transactions in flight that the same amount of GDDR5 would. Given the 5W difference per board, 30 vs 65W, 8GB of DDR2 looks to only pull about 5W, roughly the same as a GDDR5 chip or two. The R2100 will cost around $800, and the R2500 runs about $1500.